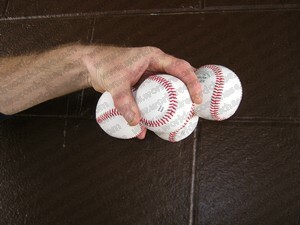 This is the story behind my Guinness World Record™ for the Most baseballs in hand palm-down. Only four? That's right, folks: only four. I don't mean to disappoint you, but I'd like you to understand that even world record breakers face the limits of having been born human. When I first held a baseball in my hand, I was surprised at how large they are. When I held two, I wondered how best to grip them evenly. When I tried three, my fingers slipped. I knew that holding four wouldn't be easy for every person. Once again, I was being driven by my passion for word record-breaking. Whereas many people may have thought this not to be worth persevering with, I viewed things differently: what would I need to do to turn this opportunity into my own world record. I began planning. In fact, it wasn't so much that I needed to 'plan' in the traditional sense than that I'd need to force my fingers to get this right. I borrowed some baseballs and spent a lot of time with them. Local media came along to see me make several world record attempts that day. Of those the presenter for the biggest radio station there took an interest in, it was this. With a bunch of onlookers waiting for me to produce something worth looking at, I tipped out the baseballs in my bag. Once those involved had read the rules, I handed out the notes and got my helpers to gather round. The lead-up to this world record was hardly impressive – I could have been about to deliver the most boring school lesson. But the children present perked up when they saw what I could do. As I'd suspected, they walked forward to the table to watch me more closely. So did the radio presenter and others from various media. Palm-up, I placed the first ball down. Nobody said anything. I placed the second and still nobody said a word. Then the third and fourth. “Yes, so what!” I heard. Quickly, I spun my hand upside-down and waited for the timekeeper to instruct my next move. The balls all remained in place. My fingers gripped them comfortably and I was relaxed. At the timekeeper's command, I released the four baseballs and the radio presenter immediately reached out for them. I'd completed the admin I was required to submit, so it was then time to see if the others present would show any real interest. It might have been because of the radio presenter and his assistant that the youths and children tightened their positions around the table, like magnets. One after the other, almost every person there wanted to try and beat me. I was quietly smiling as I admired the young ones' positivity. The children each looked at me and at each other with confidence, and gave it a try but couldn't. I watched them slink away one by one. The radio presenter, however, wasn't going to abandon the idea that easily. Oh no. He and I discussed the method one would need to succeed and we chatted briefly about the type of person who might be able to. We agreed, they'd have really huge hands. Over the following week, news of my world record attempt was aired on radio. Local newspapers got in touch to write up stories about my activities. I obliged. Little did these journalists know that while they were focused on detailing what I'd just done, my mind was far in the future, planning bigger world record attempts.